Type 8702 Steam Hose is specially formulated for steam service applications. With a durable wire braid featuring a 10X safety ratio, this hose reduces the risk of failure in dangerous steam applications. The heat resistant EPDM rubber tube is designed to prevent wear often caused by hot and cold cycling in steam applications. The wire braid reinforcement can be grounded and offers kink resistance. A pin-pricked EPDM rubber cover is weather resistant and offered in red (most sizes) or black for color coding and identification. In the case of most failures, a pin pricked cover will bleed rather than burst. An Oil resistant cover and a non-marking cover are also available. 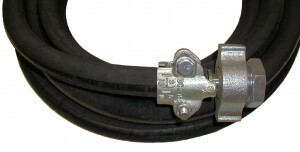 Assemblies available with ground joint couplings with bolted clamps (as shown) or crimped. Crimped assemblies meet Mil-Spec 29210E and ISO 4023/6134 Standards.